When I tell people I don’t want to enroll my daughter in preschool or dance competitions because of the price, they automatically tell me about free city programs for low-income families. I’m also asked when we will move to a bigger house so the girls can have their own room. These people have good intentions, but it’s hard to explain that I don’t want to spend money on my children frivolously. This isn’t because we don’t have the money, but because I want the money to go to better use, such as savings, retirement, and vacation funds. Another blogger has said exactly what I have been trying to tell well-meaning strangers, family members, and friends. She says, “Kids aren’t expensive. Greed is.” If she were a public speaker, I’d be giving her a standing ovation. Kids are only as expensive as you make them. Obviously, kids can sometimes be expensive if there are huge medical bills or if therapy and specialized care is needed. For most parents, I think we make our kids more expensive than they truly are. I know most of us do it because of how fiercely we love our children. Maybe some of us buy our kids a lot of stuff to make up for our own childhood inadequacies or to help us feel less guilty for the times we mess up. I want to continually give gifts to my daughter or get her little treats, but that type of love is quite superficial, especially when you consider what she really wants. She wants me to read 10 books in a row with her, snuggle with her in bed, make up stories, play hide and seek, and play make believe. I’ve had other parents complain to me about tight budgets all while their kids are dressed in new clothing, have a house full of toys, take a lot of trips, and are enrolled in several enrichment activities. There’s nothing wrong with spending money on those things, but if you don’t have the budget for it, then stop thinking it’s a necessity. Kids really don’t need all the extra fluff. As I walked through Target with my two girls, my oldest daughter kept pointing things out, saying she liked them and that they would be nice to have. Funny enough, I too saw several items I wanted and contemplated how nice they would be to have. Greed is a struggle for many of us. Dealing with it alongside your child is a great way to teach them. When my daughter commented on how she wanted a princess dress, I told her we weren’t going to get it. When she asked why, I said we didn’t need it. I then told her, “There are so many things in the store that mommy wants too, but it’s important to be wise with our money and only buy things we need.” How much of that lesson did she actually understand? I have no idea, but I know we will both have plenty more times to practice not being greedy or having the “case of the wants”. When I want something, most of the time I have to evaluate why. For example, if I see a cute baby/toddler outfit on Etsy or interesting toy in the store, I have to ask myself why I want to buy it for my child. If it’s a nice outfit, it’s usually because I want to show off my little cutie. If it’s a toy, it is usually because I think it can buy me free time or quiet time. Yes, my motives are usually all wrong. Of course, buying your child presents or things doesn’t make you a bad parent. The most frugal parent doesn’t win, nor is the parent who gives their child everything the best. It’s all about the motivation behind why we want to keep buying stuff. What do we truly mean when we say “Children are expensive”? 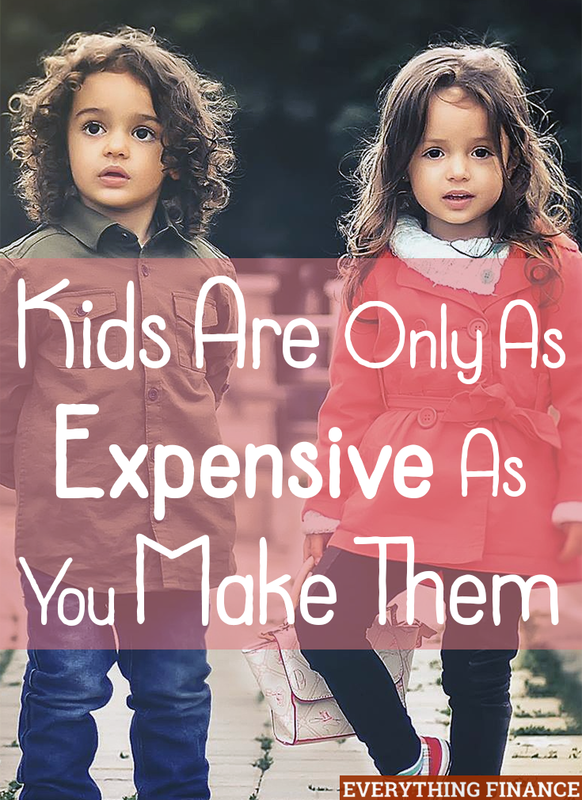 Do you think children are as expensive as we make them, or that they’re generally costly? How do you keep from spending too much on your children? We are definitely on the side that kids aren’t nearly as expensive as people say they are. It all depends on your priorities and what your value. When we were getting ready for our daughter, we bough a bunch of stuff used and on Craigslist. And today, now that she has outgrown them, we are able to resell them on Craigslist for essentially what we paid. There is no rule that says you have to buy things new. This is absolutely true. As I get ready for our little one, I’ve bought many items used, including clothing, and I know that is something my MIL looks down upon, but I don’t care. I would rather use my money to go toward more substantial things, like college funds, retirement, and annual family vacations. To me, wearing used clothing isn’t a bad thing. I’ve probably saved thousands on clothing by going to consignment stores. I go through my closet annually and get rid of things, and same with our house–constantly finding things we don’t use and end up donating or selling for a lot less than what we paid. I try and be more mindful of how we spend in order to keep the clutter and cost down. Great points. I believe that a lot of the activities and possessions that are purported to make kids smarter or more well-rounded lead only to external changes. I’m more interested in teaching my kids to be kind and helpful, creative, and independent thinkers, than I am in them developing sports or arts skills at age 3! It is really worth it to invest on our kids as when they are supported in every needs, they become more competent, smarter, and more responsible. I believe that when we take care of our kids really well, they have a higher chance to be successful in life, with our proper guidance and discipline.